For more than a decade, the Japantown Community Congress of San Jose (JCCsj) has initiated several projects to help preserve Japantown's legacy. These projects have been made possible by funding provided by California’s Senate bill SB 307 and Proposition 40 to enhance the preservation of the only three Japantowns remaining in California – San Jose, San Francisco and Los Angeles. Japantown Prepared is an all-volunteer CERT (Community Emergency Response Team) group. Our mission is to prepare San Jose Japantown for any major disasters. The NCI Program is a statewide eight-week summer internship in San Francisco’s Japantown, San Jose’s Japantown, and Little Tokyo in Los Angeles. Three prominent landmarks sit on the corner of 5th and Jackson Streets. Historic Markers – or benches – throughout Japantown provide respite and context to each site’s past. 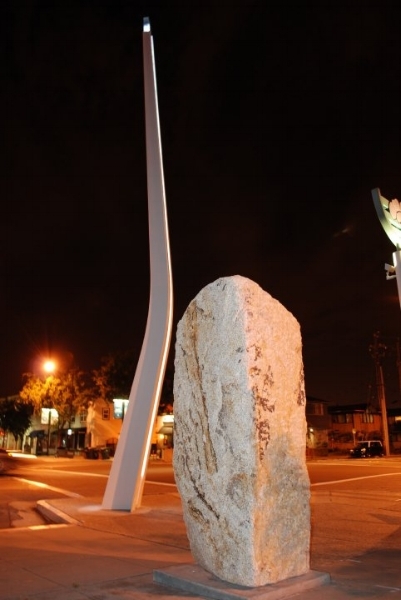 The Civil Liberties Monument and Ikoi no Ba were designed to commemorate the only three Japantowns in the United States and to represent parts of Japanese-American history. [Landmarks] help perpetuate the identity of Japantown. Visitors see the landmarks and are reminded of the rich history of the Japantown community.